What's better than one storyteller? A whole bunch of storytellers! 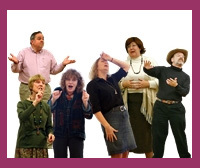 The Story Weavers is a group of storytellers that meets to hone their storytelling skills and plan performances. Each teller offers a unique style. and the resulting mix is varied and exciting. The Weavers have been together for more than 9 years, telling tales for children and adults in libraries, book stores, senior centers, Tellabration events and the NJ Storytelling Festival. They will work with you to plan an event including story and song just right for a season or a reason. Pictured are Peter Magnan, Carol Titus, Pat Wayne, Sarah Lawler, Rivka Willick and Ken Galipeau.